The Canberra suburb of Braddon is conveniently positioned just north of the Canberra CBD along the main thoroughfare into town, Northbourne Avenue. This means that if you choose to stay in any one of the luxury hotels or fully self contained serviced apartment properties in Braddon that provide discount accommodation then you will be just a short distance from the city centre and all that it has to offer. The accommodation that is available in Braddon is perfect for families, holiday makers and especially business travellers because there are so many government department buildings, corporate offices, universities and retail outlets located so close by. There are a number of other suburbs surrounding Braddon which also have plenty of offices, facilities and places of interest, like the suburbs of Ainslie, Turner, Dickson, O'Conner and Lyneham. By choosing to stay in Braddon you will be placing yourself and your family within close proximity to the numerous restaurants, tourist attractions, parkland gardens and trendy cafes in the Canberra CBD. 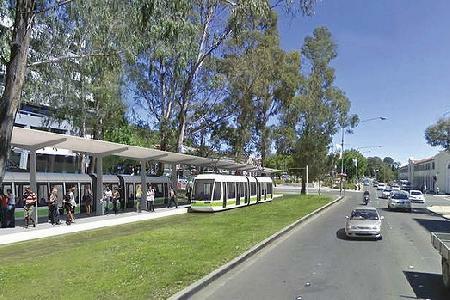 Also main campus for the Australian National University (ANU) is located close by to the suburb of Braddon. The Mercure Canberra Hotel is in a convenient location just 1 few minutes walk from the Canberra city centre, shopping centre, the Canberra Convention Centre and the Australian War Memorial. Situated in the leafy suburb of Braddon the Mercure Canberra Hotel seemlessly combines old world charm with modern comforts in order to provide boutique accommodation with luxury facilities at an affordable price. In fact the Mercure Canberra Hotel is one of Canberra's most famous hotels and has been classified by the National Trust as a property of historic significance. Capital Executive Apartment Hotel is conveniently postioned on Canberra's main boulevard which is Northbourne Avenue. This means that by choosing to stay at this CBD accommodation you will be within easy reach of everything that the city boasts including shopping, restuarants, universities, government buildings, museums and much more. The Capital Executive Apartment Hotel has plenty to offer discerning business and holiday travellers including a sauna, heated spa pool, gymnasium and even an alfresco dining courtyard overlooking the stately pines of Haig Park. What you will find when you stay in Braddon is that the Australian War Memorial is just a short distance away. This peaceful spot provides a great place to honour the fallen men and women who gave their lives in the service of this country. The war memorial also provides an excellent vantage point from which to view the Australian Parliament House right along the picturesque Anzac Parade. Just a short drive away from the suburb of Braddon is the Casino Canberra, which is located in the city centre. The casino has a wide range of fine dining options, an exciting nightclub, poker tournaments and various gamling games including blackjack, roulette, mini-baccarat and sic-bo. The Mount Ainslie Lookout is situated to the east of Braddon and is accessed via Mount Ainslie Drive, which comes off Fairbairn Avenue. From the top of this lookout you will be able to get a great view across the Canberra CBD, Lake Burley Griffin, Parliament House and to the snowy mountains in the distance. One of the best times to travel to Canberra is during spring because then you can go along and visit the Floriade Festival. This popular festival is held in the Commonwealth Park on the northern banks of Lake Burley Griffin and features a colourful display of flower arrangements and garden designs that you won't find anywhere else. Whilst staying in the Canberra you can take up drive up to the top of Black Mountain and get a great view of the city from the Telstra Tower. Also you can explore the Australian National Botanic Gardens which are located at the foot of this mountain, where you can see an extensive collection of natives trees, schubs, flowers and other unique plants. The main shopping area in Canberra itself is the Canberra Centre Shopping Complex which is located in the heart of the Canberra CBD. It is just a short distance from the suburb of Braddon and features an array of fashion boutique stores, book shops, food outlets, variety stores and large department stores. On the eastern side of Braddon you will find the Ainslie Football Park and the Majura Oval right next to each other. These suburban football grounds play host to numerous rugby leaugue, rugby union, AFL football, soccer and cricket matches throughout the course of the year. To the north of Braddon you will find the Dickson shopping precinct which is near the corner of Northbourne Avenue and Antil Street. This suburban shopping strip has a variety of different shops including major supermarkets, department stores, fast food outlets, cafes and quality restaurants. If you are keen to keep fit during your stay in Canberra then why not head down to Haig Park, where you will find numerous walking and jogging trails that are scattered amoungt the beautiful pines trees that make up the park surrounds.